Laura Mercier Custom Compact leads the way to customizable, convenient and countless looks in one refined compact. Accommodating three of your favorite Sateen, Luster or Matte Eye Colours, Second Skin Cheek Colour, Eye Liner or Caviar Eye Liner, pop out your selections and place in the Custom Compact. The exceptional design of the compact ensures that each pan simply snaps in and stays in place until you are ready to change out your favorite colours. All Eye Colours, Eye Liners, Caviar Eye Liners and Second Skin Cheek Colours sold separately. 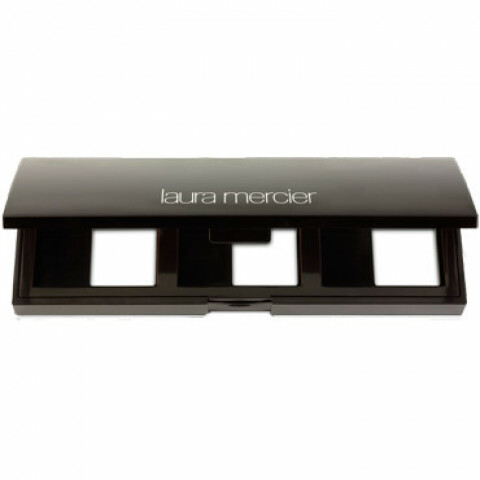 Select your three favorite Laura Mercier Eye Colours, Eye Liner, Caviar Eye Liner or Second Skin Cheek Colours, pop them out of their interchangeable compacts and place them in the Custom Compact. Change them out at your leisure. All colours sold separately. Great for customization if you like creating your own palette. Also very well made. This sturdy case is so convinient that I almost never have to get the original palettes and save money on the refills. I always customize with different eyeshadows and powders, good to have something like this! It's very sturdy and protects my powders.